Because C/C++ allow bitfields, this is not a simple LLVM pointer, it may be a pointer plus a bitrange. Definition at line 166 of file CGValue.h. Definition at line 430 of file CGValue.h. 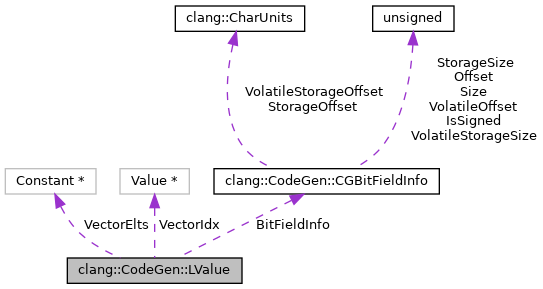 Referenced by clang::CodeGen::CodeGenFunction::convertTempToRValue(), and clang::CodeGen::CodeGenFunction::EmitRValueForField(). Definition at line 326 of file CGValue.h. Referenced by AddVariableConstraints(), clang::CodeGen::ReductionCodeGen::adjustPrivateAddress(), clang::CodeGen::CodeGenFunction::callCStructCopyAssignmentOperator(), clang::CodeGen::CodeGenFunction::callCStructCopyConstructor(), clang::CodeGen::CodeGenFunction::callCStructDefaultConstructor(), clang::CodeGen::CodeGenFunction::callCStructDestructor(), clang::CodeGen::CodeGenFunction::callCStructMoveAssignmentOperator(), clang::CodeGen::CodeGenFunction::callCStructMoveConstructor(), castValueFromUintptr(), clang::CodeGen::CallArg::copyInto(), createBinOpInfoFromIncDec(), drillIntoBlockVariable(), clang::CodeGen::CodeGenFunction::EmitAggregateCopy(), clang::CodeGen::CodeGenFunction::EmitARCStoreStrong(), clang::CodeGen::CodeGenFunction::EmitArraySubscriptExpr(), clang::CodeGen::CodeGenFunction::EmitAtomicCompareExchange(), clang::CodeGen::CodeGenFunction::EmitAtomicLoad(), clang::CodeGen::CodeGenFunction::EmitAtomicStore(), clang::CodeGen::CodeGenFunction::EmitCastLValue(), emitCombinerOrInitializer(), clang::CodeGen::CodeGenFunction::EmitConstructorBody(), clang::CodeGen::CodeGenFunction::EmitCXXPseudoDestructorExpr(), emitDestructorsFunction(), clang::CodeGen::CodeGenFunction::EmitExtVectorElementExpr(), clang::CodeGen::CodeGenFunction::emitImplicitAssignmentOperatorBody(), clang::CodeGen::ReductionCodeGen::emitInitialization(), clang::CodeGen::CodeGenFunction::EmitInitializerForField(), clang::CodeGen::CodeGenFunction::EmitLoadOfLValue(), clang::CodeGen::CodeGenFunction::EmitLoadOfReference(), clang::CodeGen::CodeGenFunction::EmitLoadOfScalar(), clang::CodeGen::CodeGenFunction::EmitLValueForField(), clang::CodeGen::CodeGenFunction::EmitLValueForFieldInitialization(), EmitMemberInitializer(), clang::CodeGen::CodeGenFunction::EmitMSVAListRef(), clang::CodeGen::CodeGenFunction::EmitObjCMessageExpr(), EmitOMPAggregateInit(), emitOMPArraySectionBase(), clang::CodeGen::CodeGenFunction::EmitOMPDistributeLoop(), clang::CodeGen::CodeGenFunction::EmitOMPReductionClauseInit(), clang::CodeGen::CodeGenFunction::EmitOMPWorksharingLoop(), emitOutlinedFunctionPrologue(), clang::CodeGen::CodeGenFunction::EmitParmDecl(), clang::CodeGen::CodeGenFunction::EmitPointerWithAlignment(), emitPrivatesInit(), emitProxyTaskFunction(), emitReduceFiniFunction(), clang::CodeGen::CodeGenFunction::EmitScalarInit(), clang::CodeGen::CodeGenFunction::EmitSimpleOMPExecutableDirective(), clang::CodeGen::CodeGenFunction::EmitStoreOfScalar(), clang::CodeGen::CodeGenFunction::EmitStoreThroughLValue(), clang::CodeGen::emitTaskInit(), emitTaskPrivateMappingFunction(), clang::CodeGen::CGOpenMPRuntimeNVPTX::emitTeamsOutlinedFunction(), EmitTypeidFromVTable(), clang::CodeGen::CodeGenFunction::EmitUnaryOpLValue(), clang::CodeGen::CodeGenFunction::EmitVAListRef(), emitWriteback(), emitWritebackArg(), findPeephole(), forConstantArrayExpansion(), clang::CodeGen::AggValueSlot::forLValue(), clang::CodeGen::CodeGenFunction::generateObjCGetterBody(), clang::CodeGen::CodeGenFunction::GenerateObjCSetter(), clang::CodeGen::CallArg::getRValue(), isBlockVarRef(), isSimpleZero(), loadToBegin(), rewriteInputConstraintReferences(), clang::CodeGen::CodeGenFunction::StartFunction(), tryEmitARCCopyWeakInit(), and tryEmitARCRetainLoadOfScalar(). Definition at line 313 of file CGValue.h. Definition at line 315 of file CGValue.h. Referenced by clang::CodeGen::ReductionCodeGen::adjustPrivateAddress(), clang::CodeGen::CodeGenFunction::EmitARCStoreStrong(), clang::CodeGen::CodeGenFunction::EmitCheckedLValue(), emitGlobalToListCopyFunction(), emitListToGlobalCopyFunction(), clang::CodeGen::CodeGenFunction::EmitLValue(), emitReduceFiniFunction(), clang::CodeGen::CGOpenMPRuntimeNVPTX::emitTeamsOutlinedFunction(), and isFullSizeType(). Definition at line 318 of file CGValue.h. Referenced by clang::CodeGen::CodeGenFunction::EmitArraySubscriptExpr(), EmitAtomicUpdateValue(), clang::CodeGen::CodeGenFunction::EmitCastLValue(), clang::CodeGen::CodeGenFunction::EmitExtVectorElementExpr(), clang::CodeGen::CodeGenFunction::EmitLoadOfScalar(), clang::CodeGen::CodeGenFunction::EmitLValue(), clang::CodeGen::CodeGenFunction::EmitLValueForField(), clang::CodeGen::CodeGenFunction::EmitLValueForFieldInitialization(), emitOMPArraySectionBase(), clang::CodeGen::CodeGenFunction::EmitPointerWithAlignment(), clang::CodeGen::CodeGenFunction::EmitStoreOfScalar(), clang::CodeGen::CodeGenFunction::EmitUnaryOpLValue(), and loadToBegin(). Definition at line 304 of file CGValue.h. Definition at line 354 of file CGValue.h. Referenced by clang::CodeGen::CodeGenFunction::EmitConstructorBody(), clang::CodeGen::CodeGenFunction::EmitLoadOfBitfieldLValue(), and clang::CodeGen::CodeGenFunction::EmitStoreThroughBitfieldLValue(). Definition at line 358 of file CGValue.h. Referenced by EmitAtomicUpdateValue(), clang::CodeGen::CodeGenFunction::EmitLoadOfBitfieldLValue(), and clang::CodeGen::CodeGenFunction::EmitStoreThroughBitfieldLValue(). Definition at line 357 of file CGValue.h. Definition at line 341 of file CGValue.h. Referenced by clang::CodeGen::CodeGenFunction::EmitExtVectorElementExpr(), clang::CodeGen::CodeGenFunction::EmitExtVectorElementLValue(), clang::CodeGen::CodeGenFunction::EmitLoadOfExtVectorElementLValue(), and clang::CodeGen::CodeGenFunction::EmitStoreThroughExtVectorComponentLValue(). Definition at line 348 of file CGValue.h. Referenced by EmitAtomicUpdateValue(), clang::CodeGen::CodeGenFunction::EmitExtVectorElementExpr(), clang::CodeGen::CodeGenFunction::EmitExtVectorElementLValue(), clang::CodeGen::CodeGenFunction::EmitLoadOfExtVectorElementLValue(), and clang::CodeGen::CodeGenFunction::EmitStoreThroughExtVectorComponentLValue(). Definition at line 344 of file CGValue.h. Definition at line 364 of file CGValue.h. Referenced by clang::CodeGen::CodeGenFunction::EmitLoadOfGlobalRegLValue(), and clang::CodeGen::CodeGenFunction::EmitStoreThroughGlobalRegLValue(). Definition at line 265 of file CGValue.h. Referenced by clang::CodeGen::CodeGenFunction::EmitScalarInit(), emitWriteback(), and emitWritebackArg(). Definition at line 322 of file CGValue.h. Referenced by AddVariableConstraints(), clang::CodeGen::ReductionCodeGen::adjustPrivateAddress(), createBinOpInfoFromIncDec(), clang::CodeGen::CodeGenFunction::EmitCallee(), clang::CodeGen::CodeGenFunction::EmitCastLValue(), clang::CodeGen::CodeGenFunction::EmitCheckedLValue(), emitCopyprivateCopyFunction(), emitCPPObjectAtomicSetterCall(), clang::CodeGen::CodeGenFunction::EmitDeclRefLValue(), emitGlobalToListCopyFunction(), emitGlobalToListReduceFunction(), emitListToGlobalCopyFunction(), emitListToGlobalReduceFunction(), clang::CodeGen::CodeGenFunction::EmitLValue(), clang::CodeGen::CodeGenFunction::EmitObjCIvarRefLValue(), emitPrivatesInit(), emitProxyTaskFunction(), emitReduceFiniFunction(), clang::CodeGen::CodeGenFunction::EmitReferenceBindingToExpr(), clang::CodeGen::CodeGenFunction::EmitRValueForField(), emitStructSetterCall(), clang::CodeGen::emitTaskInit(), emitTaskPrivateMappingFunction(), clang::CodeGen::CGOpenMPRuntimeNVPTX::emitTeamsOutlinedFunction(), isFullSizeType(), and isSimpleZero(). Definition at line 310 of file CGValue.h. Referenced by clang::CodeGen::CodeGenFunction::EmitDeclRefLValue(), clang::CodeGen::CodeGenFunction::EmitExtVectorElementExpr(), clang::CodeGen::CodeGenFunction::EmitLoadOfLValue(), clang::CodeGen::CodeGenFunction::EmitLValueForField(), clang::CodeGen::CodeGenFunction::EmitStoreThroughLValue(), clang::CodeGen::emitTaskInit(), clang::CodeGen::CodeGenFunction::EmitUnaryOpLValue(), clang::CodeGen::AggValueSlot::forLValue(), and clang::CodeGen::CodeGenFunction::generateObjCGetterBody(). Definition at line 311 of file CGValue.h. Definition at line 307 of file CGValue.h. Referenced by clang::CodeGen::CodeGenFunction::EmitAggregateCopy(), EmitAtomicUpdateValue(), clang::CodeGen::CodeGenFunction::EmitCastLValue(), clang::CodeGen::CodeGenFunction::EmitDeclRefLValue(), clang::CodeGen::CodeGenFunction::EmitLoadOfReference(), clang::CodeGen::CodeGenFunction::EmitLoadOfScalar(), clang::CodeGen::CodeGenFunction::EmitLValue(), clang::CodeGen::CodeGenFunction::EmitLValueForField(), clang::CodeGen::CodeGenFunction::EmitPointerWithAlignment(), emitPrivatesInit(), clang::CodeGen::CodeGenFunction::EmitStoreOfScalar(), and clang::CodeGen::CodeGenModule::getTBAAInfoForSubobject(). Definition at line 263 of file CGValue.h. Referenced by clang::CodeGen::CodeGenFunction::callCStructCopyAssignmentOperator(), clang::CodeGen::CodeGenFunction::callCStructCopyConstructor(), clang::CodeGen::CodeGenFunction::callCStructDefaultConstructor(), clang::CodeGen::CodeGenFunction::callCStructDestructor(), clang::CodeGen::CodeGenFunction::callCStructMoveAssignmentOperator(), clang::CodeGen::CodeGenFunction::callCStructMoveConstructor(), clang::CodeGen::CodeGenFunction::EmitAggregateCopyCtor(), clang::CodeGen::CodeGenFunction::EmitARCStoreStrong(), clang::CodeGen::CodeGenFunction::EmitArraySubscriptExpr(), clang::CodeGen::CodeGenFunction::EmitAtomicLoad(), clang::CodeGen::CodeGenFunction::EmitAtomicStore(), EmitAtomicUpdateValue(), clang::CodeGen::CodeGenFunction::EmitDeclRefLValue(), clang::CodeGen::CodeGenFunction::EmitExtVectorElementLValue(), emitGlobalToListCopyFunction(), clang::CodeGen::ReductionCodeGen::emitInitialization(), emitListToGlobalCopyFunction(), clang::CodeGen::CodeGenFunction::EmitLoadOfBitfieldLValue(), clang::CodeGen::CodeGenFunction::EmitLoadOfExtVectorElementLValue(), clang::CodeGen::CodeGenFunction::EmitLoadOfGlobalRegLValue(), clang::CodeGen::CodeGenFunction::EmitLoadOfLValue(), clang::CodeGen::CodeGenFunction::EmitLoadOfReference(), clang::CodeGen::CodeGenFunction::EmitLoadOfReferenceLValue(), clang::CodeGen::CodeGenFunction::EmitLoadOfScalar(), clang::CodeGen::CodeGenFunction::EmitLValue(), clang::CodeGen::CodeGenFunction::EmitLValueForField(), clang::CodeGen::CodeGenFunction::EmitNullabilityCheck(), clang::CodeGen::CodeGenFunction::EmitOMPAtomicSimpleUpdateExpr(), clang::CodeGen::CodeGenFunction::emitOMPSimpleStore(), emitOutlinedFunctionPrologue(), emitPrivatesInit(), emitReduceFiniFunction(), emitReductionListCopy(), clang::CodeGen::CodeGenFunction::EmitScalarInit(), clang::CodeGen::CodeGenFunction::EmitStoreOfScalar(), clang::CodeGen::CodeGenFunction::EmitStoreThroughBitfieldLValue(), clang::CodeGen::CodeGenFunction::EmitStoreThroughExtVectorComponentLValue(), clang::CodeGen::CodeGenFunction::EmitStoreThroughGlobalRegLValue(), clang::CodeGen::CodeGenFunction::EmitStoreThroughLValue(), emitTaskPrivateMappingFunction(), clang::CodeGen::CodeGenFunction::EmitUnaryOpLValue(), isBlockVarRef(), isSimpleZero(), loadToBegin(), clang::CodeGen::CodeGenFunction::LValueIsSuitableForInlineAtomic(), and rewriteInputConstraintReferences(). Definition at line 334 of file CGValue.h. Referenced by clang::CodeGen::CodeGenFunction::EmitLoadOfLValue(), and clang::CodeGen::CodeGenFunction::EmitStoreThroughLValue(). Definition at line 338 of file CGValue.h. Referenced by EmitAtomicUpdateValue(), clang::CodeGen::CodeGenFunction::EmitLoadOfLValue(), and clang::CodeGen::CodeGenFunction::EmitStoreThroughLValue(). Definition at line 337 of file CGValue.h. Definition at line 259 of file CGValue.h. Definition at line 284 of file CGValue.h. Referenced by clang::CodeGen::CodeGenFunction::EmitARCStoreStrong(), and emitWriteback(). Definition at line 253 of file CGValue.h. Referenced by createBinOpInfoFromIncDec(), EmitAtomicUpdateValue(), clang::CodeGen::CodeGenFunction::EmitCheckedLValue(), clang::CodeGen::CodeGenFunction::EmitConstructorBody(), clang::CodeGen::CodeGenFunction::EmitLoadOfLValue(), clang::CodeGen::CodeGenFunction::EmitStoreThroughLValue(), and isSimpleZero(). Definition at line 254 of file CGValue.h. Referenced by EmitAtomicUpdateValue(), clang::CodeGen::CodeGenFunction::EmitExtVectorElementExpr(), clang::CodeGen::CodeGenFunction::EmitLoadOfLValue(), and clang::CodeGen::CodeGenFunction::EmitStoreThroughLValue(). Definition at line 278 of file CGValue.h. Referenced by clang::CodeGen::CodeGenFunction::EmitStoreThroughLValue(), and setObjCGCLValueClass(). Definition at line 255 of file CGValue.h. Referenced by clang::CodeGen::CodeGenFunction::EmitLoadOfLValue(), clang::CodeGen::CodeGenFunction::EmitOMPAtomicSimpleUpdateExpr(), emitSimpleAtomicStore(), and clang::CodeGen::CodeGenFunction::EmitStoreThroughLValue(). Definition at line 275 of file CGValue.h. Definition at line 290 of file CGValue.h. Referenced by clang::CodeGen::CodeGenFunction::EmitLoadOfScalar(), and clang::CodeGen::CodeGenFunction::EmitStoreOfScalar(). Definition at line 272 of file CGValue.h. Definition at line 269 of file CGValue.h. Definition at line 296 of file CGValue.h. Referenced by EmitDeclInit(), and clang::CodeGen::CodeGenFunction::EmitStoreThroughLValue(). Definition at line 293 of file CGValue.h. Referenced by EmitDeclInit(), clang::CodeGen::CodeGenFunction::EmitLoadOfLValue(), and clang::CodeGen::CodeGenFunction::EmitStoreThroughLValue(). Definition at line 258 of file CGValue.h. Definition at line 251 of file CGValue.h. Referenced by clang::CodeGen::CodeGenFunction::EmitArraySubscriptExpr(), clang::CodeGen::CodeGenFunction::EmitAtomicLoad(), clang::CodeGen::CodeGenFunction::EmitAtomicStore(), EmitAtomicUpdateValue(), clang::CodeGen::CodeGenFunction::EmitCheckedLValue(), clang::CodeGen::CodeGenFunction::EmitExtVectorElementExpr(), clang::CodeGen::CodeGenFunction::emitImplicitAssignmentOperatorBody(), clang::CodeGen::CodeGenFunction::EmitInitializerForField(), clang::CodeGen::CodeGenFunction::EmitLoadOfLValue(), clang::CodeGen::CodeGenFunction::EmitLValue(), clang::CodeGen::CodeGenFunction::EmitReferenceBindingToExpr(), clang::CodeGen::CodeGenFunction::EmitStoreThroughLValue(), clang::CodeGen::CodeGenFunction::EmitUnaryOpLValue(), findPeephole(), forConstantArrayExpansion(), isBlockVarRef(), isFullSizeType(), and isSimpleZero(). Definition at line 281 of file CGValue.h. Definition at line 252 of file CGValue.h. Definition at line 300 of file CGValue.h. Referenced by clang::CodeGen::CodeGenFunction::callCStructCopyAssignmentOperator(), clang::CodeGen::CodeGenFunction::callCStructCopyConstructor(), clang::CodeGen::CodeGenFunction::callCStructDefaultConstructor(), clang::CodeGen::CodeGenFunction::callCStructDestructor(), clang::CodeGen::CodeGenFunction::callCStructMoveAssignmentOperator(), clang::CodeGen::CodeGenFunction::callCStructMoveConstructor(), clang::CodeGen::CodeGenFunction::EmitLoadOfReference(), clang::CodeGen::CodeGenFunction::EmitLoadOfScalar(), emitSimpleAtomicStore(), clang::CodeGen::CodeGenFunction::EmitStoreOfScalar(), clang::CodeGen::CallArg::getRValue(), and clang::CodeGen::CodeGenFunction::LValueIsSuitableForInlineAtomic(). Definition at line 257 of file CGValue.h. Referenced by clang::CodeGen::CallArg::copyInto(), createBinOpInfoFromIncDec(), clang::CodeGen::CodeGenFunction::EmitAtomicLoad(), clang::CodeGen::CodeGenFunction::EmitAtomicStore(), clang::CodeGen::CodeGenFunction::EmitLoadOfBitfieldLValue(), clang::CodeGen::CodeGenFunction::EmitLoadOfExtVectorElementLValue(), clang::CodeGen::CodeGenFunction::EmitLoadOfLValue(), EmitMemberInitializer(), clang::CodeGen::CodeGenFunction::EmitStoreThroughBitfieldLValue(), clang::CodeGen::CodeGenFunction::EmitStoreThroughExtVectorComponentLValue(), clang::CodeGen::CodeGenFunction::EmitStoreThroughLValue(), and GetIntrinsic(). Definition at line 366 of file CGValue.h. Referenced by clang::CodeGen::CodeGenFunction::EmitLoadOfScalar(), clang::CodeGen::CodeGenFunction::EmitLValue(), clang::CodeGen::CodeGenFunction::EmitStoreOfScalar(), and clang::CodeGen::CodeGenFunction::MakeNaturalAlignAddrLValue(). Addr - The base address of the bit-field sequence this bit-field refers to. Info - The information describing how to perform the bit-field access. Definition at line 409 of file CGValue.h. References BitFieldInfo, clang::CodeGen::Address::getAlignment(), clang::CodeGen::Address::getPointer(), and clang::QualType::getQualifiers(). Referenced by EmitAtomicUpdateValue(), clang::CodeGen::CodeGenFunction::EmitLValueForField(), and clang::CodeGen::CGObjCRuntime::EmitValueForIvarAtOffset(). Definition at line 391 of file CGValue.h. References clang::CodeGen::Address::getAlignment(), clang::CodeGen::Address::getPointer(), clang::QualType::getQualifiers(), and VectorElts. Referenced by EmitAtomicUpdateValue(), and clang::CodeGen::CodeGenFunction::EmitExtVectorElementExpr(). Definition at line 421 of file CGValue.h. References clang::CodeGen::Address::getAlignment(), clang::CodeGen::Address::getPointer(), and clang::QualType::getQualifiers(). Definition at line 379 of file CGValue.h. References clang::CodeGen::Address::getAlignment(), clang::CodeGen::Address::getPointer(), clang::QualType::getQualifiers(), and VectorIdx. Referenced by clang::CodeGen::CodeGenFunction::EmitArraySubscriptExpr(), and EmitAtomicUpdateValue(). Definition at line 327 of file CGValue.h. Referenced by drillIntoBlockVariable(), emitGlobalToListCopyFunction(), emitListToGlobalCopyFunction(), clang::CodeGen::CodeGenFunction::EmitScalarInit(), clang::CodeGen::CGOpenMPRuntimeNVPTX::emitTeamsOutlinedFunction(), and rewriteInputConstraintReferences(). Definition at line 316 of file CGValue.h. Definition at line 287 of file CGValue.h. Definition at line 319 of file CGValue.h. Definition at line 305 of file CGValue.h. Definition at line 279 of file CGValue.h. Definition at line 276 of file CGValue.h. Referenced by clang::CodeGen::CodeGenFunction::EmitArraySubscriptExpr(), clang::CodeGen::CodeGenFunction::EmitDeclRefLValue(), and isSimpleZero(). Definition at line 291 of file CGValue.h. Referenced by EmitNontemporalLoad(), and EmitNontemporalStore(). Definition at line 273 of file CGValue.h. Definition at line 270 of file CGValue.h. Definition at line 308 of file CGValue.h. Definition at line 282 of file CGValue.h. Definition at line 185 of file CGValue.h. Definition at line 182 of file CGValue.h. Definition at line 179 of file CGValue.h.